Comment A mixed walk with stiles and some steep climbs but excellent views. There are short sections of road walking when extreme care should be taken. With ‘The Drum’ on the left, walk straight up the old road soon reaching a junction with the new road. Keep ahead with care (best to cross to the verge the other side), ignoring a footpath off on the left. Soon pass a bungalow on the right and an electricity substation. Look for a second footpath on the left. Turn off onto this footpath. The path goes up the centre of a long upward sloping field. At the start is Hayton Wood on the left. Down on the right, behind a tree line is the busy road just crossed. Climb gradually up the slope (if sheep are in the field there may be a low wire fence to cross) veering away from the wood on the left all the time. Eventually, at the top of the rise and the top of the field, is a wire fence. In the centre is a stile. Cross into the field ahead. Look for a fieldgate in the hedge on the far side. Cross over to this and emerge onto a road. Turn right on this road with care (called Blind House Lane) and walk down to a road junction. Cross from side to side to make sure of maximum visibility. At the junction take a footpath up a slight bank on the left. New bushes have been planted on the corner but soon reach a stile behind into a field. Cross to a ladder stile, then on over a drive to a second ladder stile into a further field. At the moment the path goes over to a stile by houses, then turns right up to meet a road. The true route bears right to the far right corner of the field to a stile by a fieldgate and emerges straight onto the road. In any event turn right on the road and follow it upto a junction with a main road. Cross with great care to a minor road opposite. In a few paces turn left up the entrance drive to a house called ‘The Outlook’. Just before the house bear right by a hedge to a stile. Cross this and climb steeply up to another stile in the top corner. Continue uphill, with excellent views, close to the hedge on the left. At the top of the rise reach a wire fence. Go right for a short distance to a corner and then left to still follow the fence on the left up to a kissing gate on the North Downs Way. Cross the NDW into a field and go diagonally right uphill across the field to a corner of a hedge. Keep on in the same direction across the field to reach a road. Turn left on this busy road and walk some distance along. Eventually pass a nursery on the right, then some houses. On passing Wychling Cottage, turn right on a footpath and soon cross a stile into a field. Bear right slightly downhill, passing the end corners of two fences. Then keep on heading more steeply downhill towards a village in the valley below (do not be tempted to follow the sheep tracks which keep to the high ground instead aim for the far bottom corner of the field). At the bottom of the hill is a stile into the corner of a field in the valley (currently being repaired). Cross the stile and turn left to follow the lefthand hedge uphill for some way. Near the top of the rise, veer right, away from the hedge on an obvious path. At the top of the rise look for a stile on your left by a double wooden fieldgate, and go over onto a road. Turn right and follow the road for 100 metres looking for a footpath on the right. Follow this downhill across a field to a stile at the bottom. Over the stile turn right on a lane and go almost immediately left on a concealed narrow path to the left of a double garage. At the end, cross a stile into an open field. Go ahead, uphill, to a second stile or gate, and follow a green track winding leftwards upto a road. Cross the road, bearing slightly left, and climb the bank to a stile. Cross the stile into a field and bear diagonally left to a stile by metal fieldgates. Keep across the next field in the same direction with Lyminge below. Cross a stile by horse paddocks into an enclosed path which drops downhill, turning right to a double stile then left again downhill and out to a road down a steep bank. Turn right on the road, still downhill. At a lefthand bend turn right up the access road to the village hall. Pass this and enter a sunken track going uphill by a hedge. At the top of the slope are fine views of the village. Keep on until a stile is visible, up a bank on the right. Ignore this and veer over left onto a wider bridleway. This soon reaches a metal fieldgate. Go through and walk through woods to an open field. Follow the field edge for some distance to reach a fieldgate. Pass through the gate into a paddock and cross to another gate giving onto a main road. Turn right on the road and left at the junction ahead (use the wide grassy verge). The next 200 metres along the road are extremely dangerous. Walk along facing the traffic. It would be sensible if a permissive path went along the edge of the field on the right. Local people might actually be doing this. Eventually reach a stile on the right. Cross and walk uphill along a field edge. Cross and continue up a second field to a fence with two stiles quite close to each other. Cross the first one then turn left along the fence to the second. Turn left over this, and go down to Etchinghill. This is the path used on the outward route that soon becomes enclosed between horse paddocks. 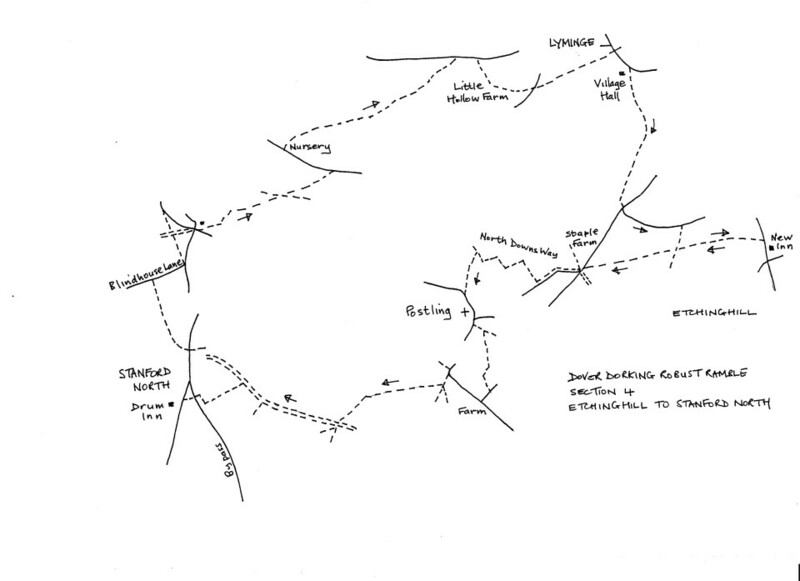 Continue out to the main road and turn right to reach the ‘New Inn’ and the start of the section.